An amazing place to stay with a wonderful host, even though he was on crutches! The village is small and friendly with amazing views from the top of the hills. Even though we don't climb I can see how Casa Catalunya is the perfect base for sporty types to start and end their days. Can't recommend the property enough. The quiet and atmospheric village of Margalef is a fantastic base for climbing and walking. 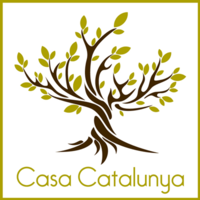 Casa Catalunya has been beautifully restored to provide spacious, comfortable, warm and very well equipped accommodation. Anna, the most welcoming and friendly shop keeper ever, will brighten your day. Mac's local knowledge and welcoming nature made for a great stay. We had a great time in Casa Catalunya! The appartment is really nice (and fresh 🙂 ), and Mac was really friendly and helpful. Moreover the whole small village of Margalef had an incredible welcomming atmosphere, and the area was amazing and not too crowded, thus we definitely recommend this place even for non climbers ^^ ! We were four people staying in the upper part. Really nice apartment and good location in the heart of Margalef. (We were also climbing in siurana about 40 min away) The house is beautifully restored. Kitchen with good cooking possibilities, we were cooking everyday and had a great time in the evenings playing backgammon. Definitely worth to come here to get a climbing vacation with a little extra! Spent a week near end of February. Margalef is a beautiful place, and Casa Catalunya has been beautifully restored by Holly and Mac into a fantastic place to use as a base, not only for Margalef, but for the large area of Natural playground nearby. Thanks Ian and Holly for a great stay. Holly and Mac have produced a great place to stayin Margalef with Casa Catalunya. We stayed in the studio which worked well for two people. We were also shown around the upstairs apartment which would be great in a larger group. The place has a great finish and feels like a good place to come back and relax after a hard day at the crag. The house is ideal for the climbing in Margalef but we had couple of day hits to Santa Linya as well which at 1.30hrs drive was not too much bother, and Siurana is closer again at 45 mins. Holly and Mac are really welcoming hosts, and there freindliness and passion for the area and their place has really shone through in this accommodation. Im definitely booking this place when I next go back to Margalef. La comunicación con los anfitriones ha estado muy fluida, muy atentos, facilitando orientaciones para la llegada, estancia , rutas para visitar y haciéndonos sentir muy cómodos en todo momento. El apartamento bonito, luminoso, espacioso y muy bien equipado su ubicación permite visitar toda la zona del Priorat. The house is fantastic, and offers five star comfort in a beautifully restored space. Holly made sure we had everything we needed, and gave us great local recommendations. We thoroughly enjoyed our time there and look forward to returning.